This is a picture from a few years ago, so some of you might have seen it already. It accompanied a 12 page comic story, Children of the Moon, which I did for an Australian manga anthology, Xuan Xuan. It was done in line and wash, ink and watercolours. I've come to think it has some major shortcomings, but oh well, it fits the theme :). The Princess seen here is fairly indifferent to most dragons (unlike her little sister, who is the main protagonist) - though apparently not to this particular one - and the baby dragons are the possible salvation of this small world. Lots of enchanting details, my favorites -- her delicate profile, the flow of her prettily pleated skirt, the tiny winged dragon and the star-shaped leaves. The color scheme you used are fanciful. Lovely illustration. Many new lovely works and ideas here!! I'm so glad you posted this week, Ian:> This is such a pretty drawing. 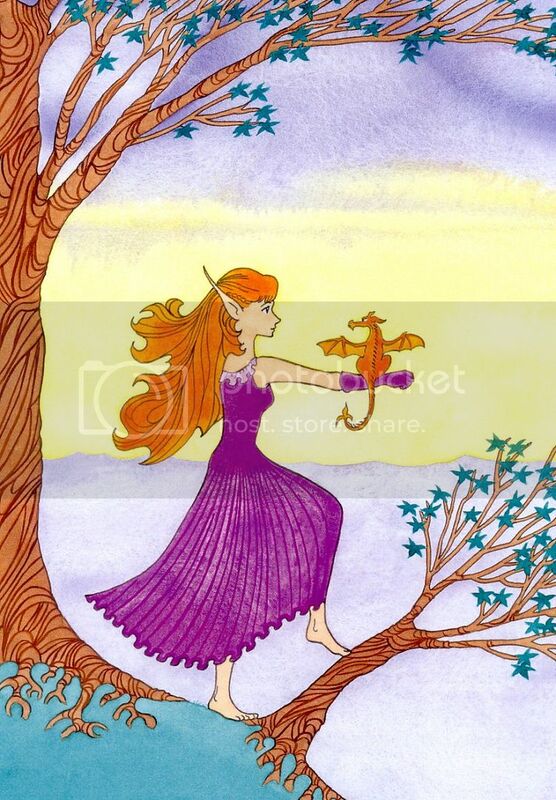 I love the colors...the purple and orange look just right together, and I love how her hair and the dragon's wings seem to match. The lines of the tree trunk and the roots create a great framing pattern around the girl and the dragon, and the flowers and pleats add a delicate touch. This is such a delightful and fanciful illustration. Hi I´m Chris. Greatings from Germany Bottrop !! Thanks, all - as I said this is from a while ago, and I'd probably do it differently now. I selected the colours pretty carefully, as I definitely reckon less is generally more in that area, and compatibility is vital. Angelique, the profile was something I really wanted to accentuate, to the point that I didn't continue the line of her jaw (which may not have been the right decision). To me, elves are at once both higher and also more animal-like in some ways - in this case close to the dragons (as you spotted with the colour-match, Carla!). The small star-shaped leaves are to do with the story: the trees had been dying but are coming back to life. I wanted natural framing too - a kind of "World Tree" reference, but also with the emphasis on nature (which is also why she has bare feet). Really lovely image Ian. I especially love how the trees are framing her. Well done. Cheers! i love the color and the lines of the tree trunk. And an electric pleated skirt-great! (i had a similar one before only in powder blue) They seem to like each other in your illustration but the princess pose looks like she was saying she's in charge.. I suppose is it early morning in your illustration? ohh very enchanting lovely illo.. and an interesting plot and story too.. so, did you make the storyline as well? Isay, I want to add that morning or evening is how I originally conceived the picture (before the story developed). LD, nice spin on the stars! VFM4, these dragons grow up to be huge!